Kohlenberg Lyceum Series Presents "Amahl and the Night Visitors"
Steven W. Rose (’69) of Potomac, Md., an agent with State Farm Insurance since 1972, will address students as the commencement speaker for the December graduation ceremony. Commencement is at 1:30 p.m. Dec. 16 in Pershing Arena. Rose is a lifetime member of the President’s Club, State Farm’s highest recognition. 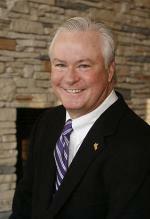 He is a recipient of Truman’s 2006 President’s Leadership Award, as well as the 2003 Distinguished Alumni Service Award. From 1995-1999, Rose was a member of the University’s National Alumni Association Board of Directors, serving as chair of the Alumni Resources Committee. Rose is also a third-term member of Truman’s Foundation Board, and has served as the board vice president. He continues to fund the annual Steve Rose Performing Arts Scholarship, assisting deserving theatre students at Truman. Rose recently chaired a special fund-raising initiative, and made a substantial leadership gift to name the performance theatre in the University’s fine arts center in Ophelia Parrish in honor of James G. Severns, professor emeritus of dramatics. As a student, Rose appeared in several campus performances directed or produced by Severns. He worked for two seasons with Severns at the University Ice House Summer Stock Theater in Hannibal, Mo., in the late 1960s. Rose was a member of Tau Kappa Epsilon, Alpha Phi Omega, the Business Administration Club, College Players, Psychology Club and the Young Democrats. Rose was featured in a national television commercial for State Farm. As a member of the Screen Actors Guild, Rose has appeared in several motion pictures, television shows and commercials shot in the Washington, D.C./Baltimore, Md., area. The Board of Governors approved a faculty promotion, faculty leaves of absence and second year reappointments at the Dec. 2 Board of Governors meeting. Ian Lindevald was approved for promotion at the meeting. He will be promoted from associate professor of physics to professor of physics effective at the beginning of the 2007 spring semester. The following faculty were approved for leaves of absence for the 2007-2008 academic year: Aaron Fine, associate professor of art; Michael Goggin, associate professor of physics; Daniel Mandell, associate professor of history; John Rutter, associate professor of biology; and Matthew Tornatore, associate professor of foreign language. Christine Harker, associate professor of English, and Donna Rhinesmith, professor of education, were approved for leaves of absence for the 2007 fall semester. Jon Beck, associate professor of computer science, and Ding-hwa Hsieh, associate professor of philosophy and religion, were approved for leaves of absence for the 2008 spring semester. The following faculty were approved for second year reappointments: James Cianciola, assistant professor of communication; Sheila Garlock, assistant professor of communication disorders; Leslie Hahner, assistant professor of communication; Melissa Holcomb, assistant professor of nursing; Jennifer Hurst, assistant professor of exercise science and athletic training clinical coordinator; John Ma, assistant professor of biology; Bob Matthews, assistant professor of computer science; Jay Self, assistant professor of communication; Mark Smith, assistant professor of communication; Tony Weisstein, assistant professor of biology; and Lin Zhang, assistant professor of marketing. Pictured are interns (seated, left to right) Ellie Glenn, Mindy Maness, Abbi Howe, Emily Gebhardt and Brittany Roebke; (standing, left to right) Joe Van Amburg, Alyssa Mayer, Aleksandar Udev, Colleen O’Brien, Chris Miller and University President Barbara Dixon; (back row, left to right) Dan Kleinsorge, Richard Boggs, Ryan Lewis and Warren Peebles. Fourteen Truman State University students will begin legislative internships at the Missouri State Capitol in Jefferson City next semester as part of the Missouri Government Internship program. The internship provides an inside look at state government. While in Jefferson City, the interns will be assigned to public officials based on compatibility and interests. The interns work with their legislator and his/her staff on a variety of jobs and tasks. The Truman interns will begin working with state representatives, legislators and in statewide offices with the start of the session Jan. 3. The spring interns are Richard Boggs, a senior communication major from Hannibal, Mo. ; Emily Gebhardt, a senior history major from Salisbury, Mo. ; Ellie Glenn, a senior political science major from Louisiana, Mo. ; Abbi Howe, a senior political science major from St. Louis; Dan Kleinsorge, a junior political science major from Middletown, Mo. ; Ryan Lewis, a senior history major from Chesterfield, Mo. ; Mindy Maness, a junior political science major from Lee’s Summit, Mo. ; Alyssa Mayer, a junior political science major from Kirksville; Chris Miller, a sophomore political science major from O’Fallon, Mo. ; Colleen O’Brien, a senior political science major from Gladstone, Mo. ; Warren Peebles, a junior political science major from Glendale, Mo. ; Brittany Roebke, a junior political science major from Plainfield, Ill.; Aleksandar Udev, a junior business administration major from Sandanski, Bulgaria; and Joe Van Amburg, a junior political science major from Weston, Mo. To participate, interested parties should sign up in the Student Union Building Office, located directly across from Mainstreet Market. Groups may also sign up by calling the Student Union Office at 785.4186. Tempera paint will be provided by the Student Union Office for each group to use. The panes that will be available to paint are located on the north side of the Take 5 game room. Each window pane is 18 inches by 30 inches. The panes will be available to paint from Dec. 12-15. The Student Union Office asks that interested groups register early, as there are only 20 panes available. Upon registration, a window pane will be assigned to each group, and detailed instructions will be given at that time. Contact Sujit Chemburkar, student union director, at sujit@truman.edu or at 785.4186 for more information. More than $10,000 has been raised to endow the Dr. Mary Giovannini Scholarship fund. The scholarship will be awarded to business majors with financial need who have made academic improvement while attending Truman. Giovannini, professor of business administration, retired at the end of the fall 2004 semester after 31 years of service to the Division of Business at Truman State University. During her career, Giovannini taught business communications, information systems, and organizational behavior courses. She was instrumental in establishing writing standards in the business and accounting curriculums and served as convenor for the business administration discipline. Giovannini also established and directed the “Europe in Transition” study abroad summer experience. Since the mid-1980s, Giovannini had served as coordinator of the Freshmen/Truman Week experience. For more information on establishing endowed funds at Truman, contact the Office of Advancement at 785.4133. Dylan Rothermel, a junior economics major from Homewood, Ill., was recently selected as a finalist for the United States National Debate Team tour Japan. Rothermel was one of only eight undergraduate and graduate students nationwide chosen to compete for the two slots available for the tour. He is the first Truman State University student to be a finalist for the process, sponsored by the Committee on International Discussion and Debate of the National Communication Association (NCA). The students chosen for the two spots on the team were from Cornell University and Emory University. Rothermel brought his own stellar record to the competition. He was among the top 16 teams nationally in parliamentary debate in 2006 and has reached at least semifinals in three of the nation’s most prestigious round-robin tournaments. As part of the try-out process, held at the NCA national office in Washington, D.C., Dec. 1-2, Rothermel presented a lecture on the history of militarism in Japan from the Tokugawa period through World War II, and participated in a policy-style debate over the question of whether the United States should support the full-scale rearmament of Japan. The Committee on International Discussion and Debate has existed since 1922 and has sponsored debate team exchanges with Britain, Japan, New Zealand, Australia, Poland, Romania, Bulgaria, the Philippines, the Baltic Republics and the former USSR. Truman has a long tradition of participation in these exchanges, stretching-back to the early part of the 20th century. Truman has hosted teams on campus from Britain, Russia, Japan and Ireland as a part of the program. Rothermel joins his teammates in the resumption of regular competitive travel in January with two tournaments in Seward, Neb., Jan. 18-22. Thanks to the partnership between Truman State University and U.S. Bank, Truman Students who have a U.S. Bank checking account may activate this feature on their ID cards. This will allow them to use their Truman ID card as an ATM/debit card starting in the spring 2007 semester. In order to begin this new service, Truman will need to replace all current student cards with a new ID. Beginning Jan. 2, 2007, Sodexho, Pickler Memorial Library and the Student Recreation Center will no longer be accepting the current Truman ID cards. In order to accommodate the new banking services, these services have purchased new equipment that will not accept the current ID cards. The ID Office will have extended hours to allow students to exchange their old ID card for the new one. The new IDs will be available in Kirk Building on Jan. 7, 2007, from 11 a.m. until 7 p.m. Also, the ID Office will have extended hours the following week, Jan. 8-12, 8 a.m. to 6 p.m.
During these times U.S. Bank will have representatives on campus to activate the students’ new ID card to an ATM/debit card if they wish to do so. The following week the ID Office will return to normal hours, 8 a.m. to 5 p.m. At this time students will need to go to a local branch of U.S. Bank to activate their card if they wish to do so. Any Bonus Bucks students have purchased through Sodexho will be transferred automatically to their new card. Students are asked to exchange their present card for the new card early so they will not be inconvenienced when they attempt to use the services associated with their Truman ID card. If you have any questions, please contact Kaye Davis, ID office coordinator, at 785.4123. A limited number of tickets are available for students, faculty and staff. Seating is general admission. Admission is free for all students faculty and staff with their University ID. Tickets for faculty and staff are available in the Center for Student Involvement, and students may pick their tickets up in the Student Activities Board office located in the Student Union Building Governors Room. The University requests that all patrons be seated five minutes prior to the performance. The University reserves the right to fill all seats, reserved and general admission, five minutes before the time of performance stated on the ticket. Contact the Public Relations Office at 785.4016 for more information. The Truman community is invited to attend these gatherings. Vinita Dew, associate professor of chemistry, will be retiring at the end of the fall 2006 semester. People may stop by to wish her well on her retirement. Rebecca McClanahan, assistant professor of nursing, will be leaving at the end of the fall 2006 semester after 31 years of service to Truman. Doug Winicker, campus planner, will retire after more than 30 years of service to Truman. Joyce McVay, business office student accounts supervisor, will retire at the end of December after 29 years of service to Truman. Dec. 12-13 - 9 a.m. to 11 p.m.
Dec. 14-15 - 9 a.m. to 7 p.m.
Dec. 18-21 - 11 a.m. to 2 p.m.
Jan. 2-6 - 11 a.m.-2 p.m.
Jan. 7 - 11 a.m.-7 p.m.
Dec. 12-14 - 7 a.m. to 2 a.m.
Dec. 15 - 7 a.m. to 6 p.m.
Dec. 16 - 10 a.m. to 2 p.m.
Dec. 18-21 - 8 a.m. to 5 p.m.
Dec. 28-29 - 8 a.m. to 5 p.m.
Jan. 2-5 - 8 a.m. to 5 p.m.
Jan. 2-5 - 8 a.m. to 2:30 p.m.
Jan. 7 - open at 3 p.m.
8:30-10 a.m. and 1-2:30 p.m.
December graduates are invited to attend the annual Graduation Pizza Party in their honor. Free pizza, soda and dessert will be available, and all graduates will receive a free gift. Those who cannot attend the event should stop by the Advancement Office in McClain Hall 100, to pick up their free Truman alumni T-shirt. Contact Denise Smith, director of alumni relations, at 785.4174 or dlsmith@truman.edu for more information. The Department of Public Safety will be providing a shuttle service for students on the above date to the Amtrak station in LaPlata. The cost of the shuttle service is $5, and payment is due by Dec. 14. Reservations are on a first-come, first-serve basis. The fee can be paid at the Public Safety Building. The shuttle will pick students up in LaPlata at the train station for return to the Public Safety Building on Jan. 7, 2007, at a pending evening time. Contact Joyce in the Department of Public Safety Office at 785.4177 for more information, or to make a reservation. TruFit Wellness is a 12-week education and exercise program focused on teaching group members the skills needed to empower lifetime health behavior changes. New for the spring 2007 semester is the addition of a weekly organized group exercise session lead by Karen Skoch, director of fitness/wellness at the Student Recreation Center. Group members will receive an overall orientation to the Student Recreation Center, including use of cardiovascular and weight room equipment, and various assessments of physical health. TruFit members will meet from noon-1 p.m. on Tuesday and Wednesday afternoons. Meetings will begin Jan. 9 and continue through April 11. Any Truman faculty or staff member who is at least 10 pounds overweight and not currently engaging in regular physical activity is encouraged to join. If you are interested in learning more about the program or would like to sign up, contact Jennifer Hurst at 665.4464 or jhurst@truman.edu. Due to the recent winter weather, the blood drives and fixed sites were closed. This has caused the current blood supply to dwindle to less than a half a day. The Red Cross desperately needs 0- and B- blood especially. Everyone who presents (whether they are able to donate or not) will receive a special thank you gift from the Red Cross. If you have planned an on-campus event for the upcoming spring semester, do not forget to submit it to the Master Calendar at http://www.truman.edu/pages/203.asp. All submissions must be made by someone representing a chartered organization or a recognized department/division/program of Truman State University. Mark Spitzer, assistant professor of English, had his poetry/creative nonfiction piece “Garuminations” accepted for publication in The Laurel Review. The men of the Xi chapter of Alpha Kappa Lambda social fraternity raised $3,500 in their annual Haunted Mansion Philanthropy. The event was for the American Cancer Society. Alpha Kappa Lambda also raised more than $300 in their annual teeter-totter event, with all proceeds also going to the American Cancer Society. Employees considering retirement who are eligible for MOSERS “80 and Out” rule and who are at least 50 years old with a sum of age and years of service credit equaling 80 or more, or who have 15 years of full-time service at the University and are at least 57 years of age at the time of retirement, are reminded that the window to apply for Truman’s Modified Supplemental Retirement Plan ends Dec. 15. This plan is voluntary, and the current window is for applications for retirements before July 1, 2007. This will be the final application window for the current Modified Supplemental Retirement Plan. Employees eligible for the plan should read Section 10.110 of the Modified Supplemental Retirement Plan Board’s Code of Policies to understand the full policies of the plan. Additional information is also available on the Modified Supplemental Retirement Plan Web site at http://hr.truman.edu/benefits/msrp/. Interested employees with questions should contact Curt Devan, director of human resources, at devanc@truman.edu, or Matt Moore, benefits coordinator, at mrmoore@truman.edu. “Lewis and Clark Across Missouri: Mapping the Historic Landscape” is now on display in the gallery of Pickler Memorial Library. On loan from the Missouri State Archives, these maps portray the Missouri River exactly as the Corps of Discovery experienced it. The Geographic Resources Center at the University of Missouri created this unique map exhibit by combining 19th century land survey records with modern mapping technology. Other materials from Pickler Memorial Library and the Violette Museum are on display. The exhibit is available during the library’s scheduled hours until the end of December. The south door of the Public Safety Building is now locked, except for handicapped access. Those wishing to enter the Department of Public Safety Office are asked to enter through the north door. French senior capstone presentations will be given from 1-4 p.m. Dec. 13 in McClain Hall 305/302. Seven French majors will discuss their senior research projects. The event is open to the University community. Contact Gregg Siewert at 785.4510 for more information. The Monitor, the University’s alternative student newspaper, will be distributed Dec. 13 to residence halls and high traffic areas on campus. The Campus Mailroom will have limited staff Dec. 15-Jan. 8. The facility will be closed the days the University is closed for holiday break. To avoid problems faculty, staff and students should not have personal packages delivered to their University addresses during this time period. The Truman Bookstore will be having Faculty/Staff Appreciation Days from Dec. 16-21.